Starring Asher Angel, Zachary Levi, Marc Strong, Jack Dylan Grazer. Abandoned at a young age, Billy Batson (Asher Angel), has careened from foster home to foster home as he seeks to find his birth mother. His latest home looks to be heading for a similar fate, when Billy’s attempt to defend his superhero obsessed foster brother (Jack Dylan Grazer) from school bullies draws the attention of a powerful wizard (Djimon Hounsou). Soon Billy is gifted with extraordinary powers, and when he says the word “Shazam!” he is turned into a being (Zachary Levi) with powers to match Superman. While the 14 year old struggles to come to terms with his newly acquired superpowers, the mysterious Dr. Thaddeus Sivana (Marc Strong) seeks to undo all of the wizard’s work, and hunt down his champion. At first glance, Shazam! is a rather traditional superhero origin tale, where the hero struggles with accepting the “call to adventure” and the responsibilities that come with great power. Here, however, there is a childish sense of glee in the discovery of those powers, as the mind of a 14 year old boy tries to come to terms with his situation. It’s something we haven’t seen in live action superhero films for a long while (maybe Raimi’s Spider-Man, or perhaps the first Ironman). This is a welcome change from the spate of darker themed films we have been seeing of late, and certainly different tonal territory for DC cinematic universe. There is some merit to viewing Shazam! as a caped version of Big, and it is a comparison that the film pays homage to. However it is also very grounded in the superhero genre, and the script often plays with those tropes to great effect. More so than any other DC film, this is a world that is shaped by beings of incredible power. For most of Shazam! that is in absentia, we’re submersed in the publicity and merchandise of that mythology, but this is certainly a world where they do exist, and that has been melded into the popular culture of the time. Then there is the adolescent power fantasy inherent in the superhero myth, the ability of the powerless to gain great strength and raise up against their oppressor. This is obviously at the heart of Billy’s journey, as well as being the core for the foster family that he’s a part of, but there is also a darker echo of this in his nemesis. Thaddeus Sivana is broken by that need for power, and when he does acquire it, turns it against those that abused him, before using it to bully others. 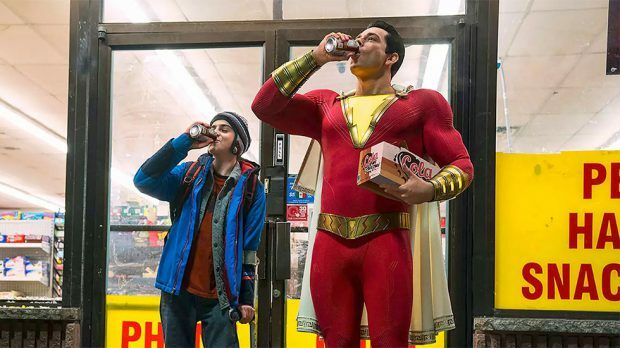 Yet despite some of the clever commentary it makes, Shazam! is at its heart a big goofy ball of fun. Levi is hilarious as the child trapped in the body of an übermensch, plunging between enthusiastically inappropriately encouraging the criminals to test out the range of his power, to being overwhelmed by the newfound burdens placed upon him. Then there is Jack Dylan Grazer (It) acting as a clueless superheroic mentor with a YouTube account. He helps build that childish intensity and shares great chemistry with either version of Batson. All of which makes Shazam! a big bundle of childlike fun wrapped up in a cape. It’s a film that does have depth and heart operating beneath the surface, but it’s perfectly fine with just operating as an audience-pleasing blockbuster.